This striking Amish Pine Wood Large Pie Safe with Tin Doors has the look of a late 1800's antique pie safe. DutchCrafters Amish Pie Safe's decorative tin doors are sure to bring an antique look into your kitchen! Pennsylvania Germans brought the Pie Safes to the area and they have remained popular ever since. 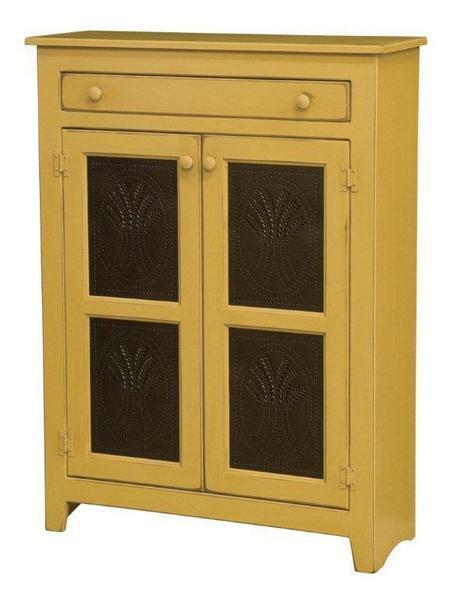 This pie safe is shown in our olde mustard painted finish and features two stationary shelves. Base to First Shelf - 12"
First Shelf to Second Shelf - 12"
Second Shelf to Top - 11"